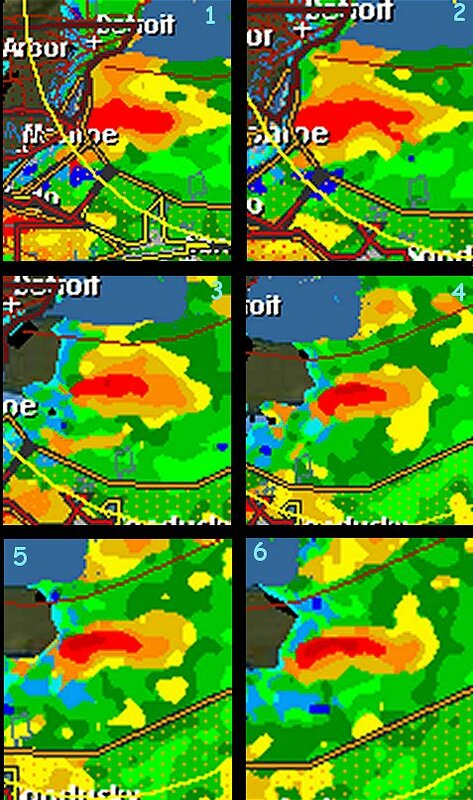 The evening of June 5 -6, 2010 was certainly an interesting evening from a weather perspective in the lower tip of Southwestern Ontario. A preliminary review of weather radar data suggests that at least two tornados passed through the area, although both may not have come to ground. What follows is an initial review of radar data that was observed via EWR and is based on a cursory analysis of radar imagery that was either observed first hand or is being reviewed as history. No analysis of atmospheric conditions has been conducted at this time. Not all data is yet available. The NWS has not yet released its Level 3 doppler data for June 5 & 6 for stations KDTX and KCLE. I can’t therefore recreate the Level 3 data observations made in real time that evening. EWR’s Scan A data from Storm Predator is autosaved, and I have over 600 images to review from that scan interval. Some other imagery came from screencaps made in real time. The “Leamington” weather pattern started as a flow of very unstable convective air that got into motion over southern Michigan earlier in the day, Saturday June 5th. 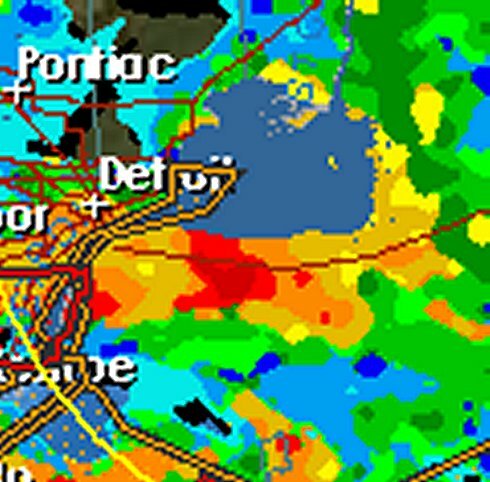 As this active weather flowed across Michigan, the NWS issued multiple tornado warnings, thunderstorm warnings, flood warnings and special marine alerts (Scan Animation 1, below). EWR Scan B was reporting mesocyclones (rotating core updrafts in a thunderstorm that define it as a supercell) and TVS signatures (tornado vortex signatures – indications that tornadogenesis may be occuring within the mesocyclone envelope) east of Detroit at about 11-11:15PM Saturday night (yes, I have no social life). By 11:30PM Saturday, an ETVS signature (Elevated Tornado Vortex Signature) was recording over a strong cell just south of Lake St. Clair. 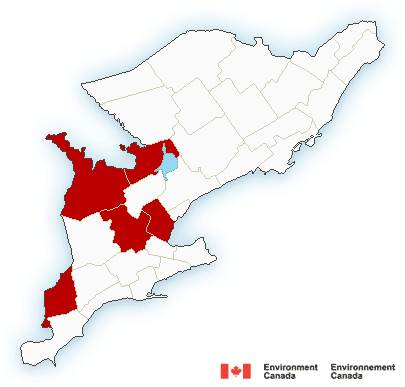 and EWR issued a special weather statement concerning these developments at 11:40PM, and the zone alert system issued an alert for SW Ontario at 11:38 PM. 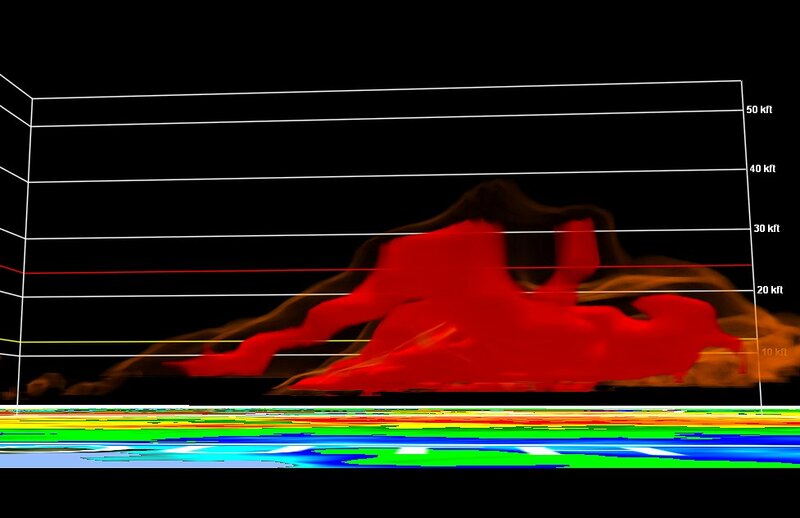 On radar, the cell had characteristics of a tornadogenic supercell (fig. 1, 2), which was confirmed by a 3D volume scan (figs. 3, 4) taken at 11:35 and 11:39PM June 5. Figure 1: 11:35PM scan: Cell shows a strong rear inflow jet, and a tornadic rotation area at its lower left. Figure 2: 11:39PM scan: The vortex is visible in the lower left, and its top end high density core is beginning to form (dark red dot near bottom centre of the cell). 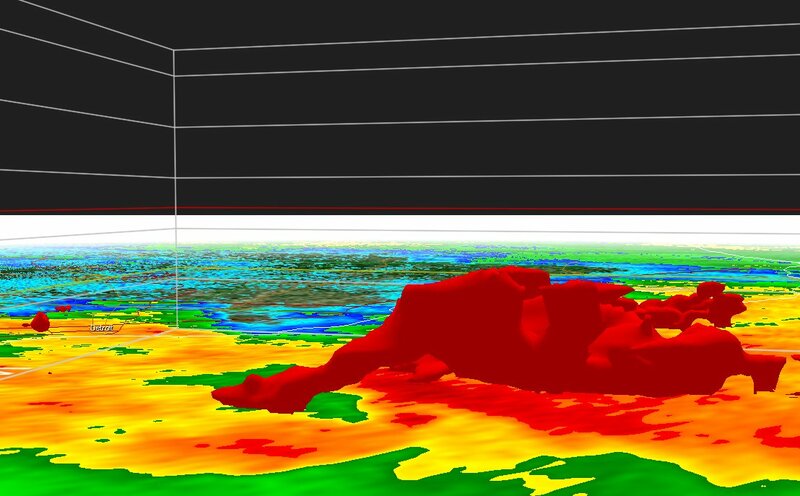 Figure 3: 3D volume scan of base reflectivity showing the well defined elevated tornado. Its not clear whether this tornado reached ground. The red is approximately the 50-60 dbz reflectivity data. This volume scan is selected for only a narrow range of scan returns. Figure 4: 3D isosurface scan of the same volume as in figure 3. This cell was tracked to about 12:30AM, then EWR was left to its own devices for the balance of the night. Environment Canada issued a tornado watch for the two at-risk regions at 12:00 midnight. This cell then passed through the region, as can be seen in the animations. 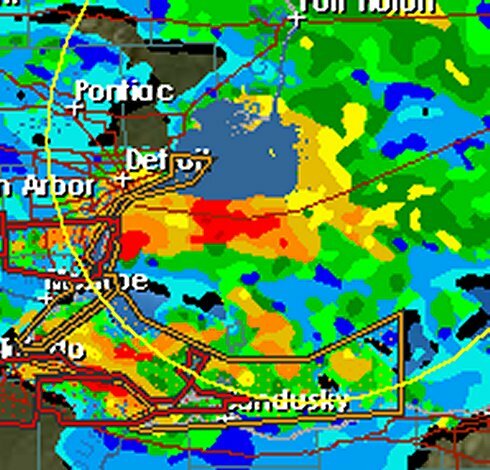 At about 2AM June 6, a second mescyclonic storm crossed over from Michigan south of Detroit (fig. 5), leaving a tornado watch zone established by the NWS. Animation 2 (below) shows this later flow pattern, starting about 10PM Saturday night. Both this and the 12 midnight storm can be seen moving through the area. Animation 3 focuses on the 3AM storm blamed for the extensive damage in the Leamington area. Figure 5 provides a snapshot of the 3AM storm cell from 2:43AM through to 3:21AM. Supercell development and mesocyclogenesis can readily be seen in the cell. Discussion of the individual frames follows the figure. Scan 3: A classic “hook and notch” supercell is beginning to develop, with its leading edge v-notch (east side), and formative hook at the west end, indicating counter-clockwise mesocyclonic rotation in the main updraft is occuring. Scan 4: The tailhook is now well formed at the east end (lower) and a weak echo region is developing at the bottom of the hook – this is likely the intake of the tornado reported in this storm. Scans 5 & 6: Scan 5 still may have some tornadic action , but the tornado is dissipating by scan 6. Meso updraft is still evident in the kidney bean shape of the cell and the darker returns on the northwest wall indicated updraft remains very strong, which also means the flanking downdrafts and outflow gust fronts will be strong also. The position relative to Lake St. Clair and the international boundary line limit of the marine warning (orange line), places the storm right over the Leamington area. Elapsed time for all of this : 30 minutes. EWR didn’t issue an alert for this later storm due to it relatively low radar density for a severe storm, less than 60dbz. Although its possible that the storm damage occured solely as a result of the 3AM storm, the severity of the 12:45PM storm may have contributed to some of the damage. Both storms occured well after darkness, and damage from the earlier storm might not have been evident until the second storm ramped up, and caught people’s attention. Animation 3: A frame-by-frame animation of the 3AM June 6, 2010, storm cell from the time it crossed into SW Ontario untill it passed out of the region. Interesting. Iv searched for a long time for some kind of explination about the tornado in Leamington. I actually visited the morning and afternoon of June 6th, after the storm, and the damage was unbelievable, something you would see in the movies. I was actually tracking the storm saturday night in Amherstburg, but i never thought that things would turn out like that. Im glad that I found actual radar images of the storm at that time, because I was sleeping by then. We actually ended up going to Leamington because I was going for a haircut and we heard about it on AM800. Afterwards we went. Anyway, it was good to find this information.